Im going to post my first attempt of making a hybrid. Step by step, bud to pod (hopefully). So heres some back ground. I got my Slc. Chia Lin 'New City' AM/AOS for a Christmas but my cat broke the spike off after it was open for a week so I saved the pollinia and stored it in a coffee filter in an envelope somewhere safe from moisture. 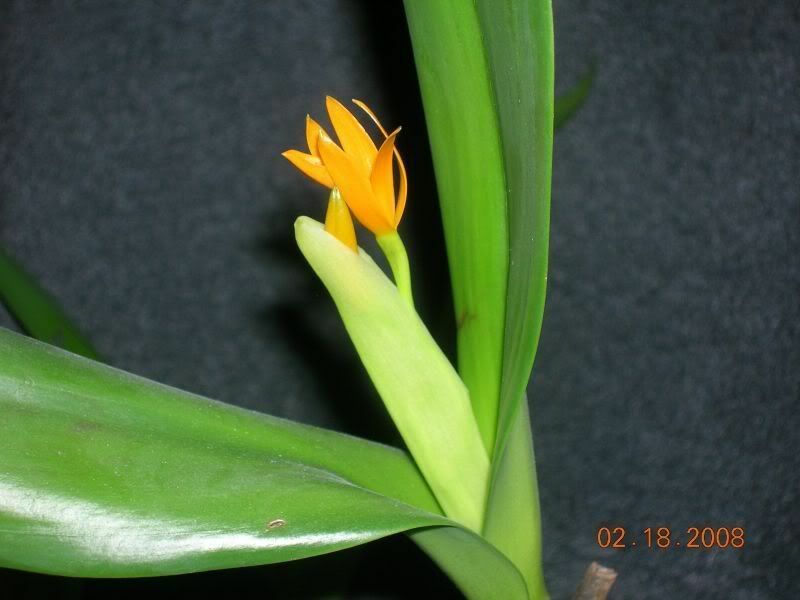 Now I've been waiting on my Guarianthe aurantiaca (formerly Cattleya aurantiaca) to bloom for me. Bolero, Catt Mandu, Brix and 1 others like this. AAaaahhhhh!!!!! I can't wait! The anticipation is going to kill me!!! 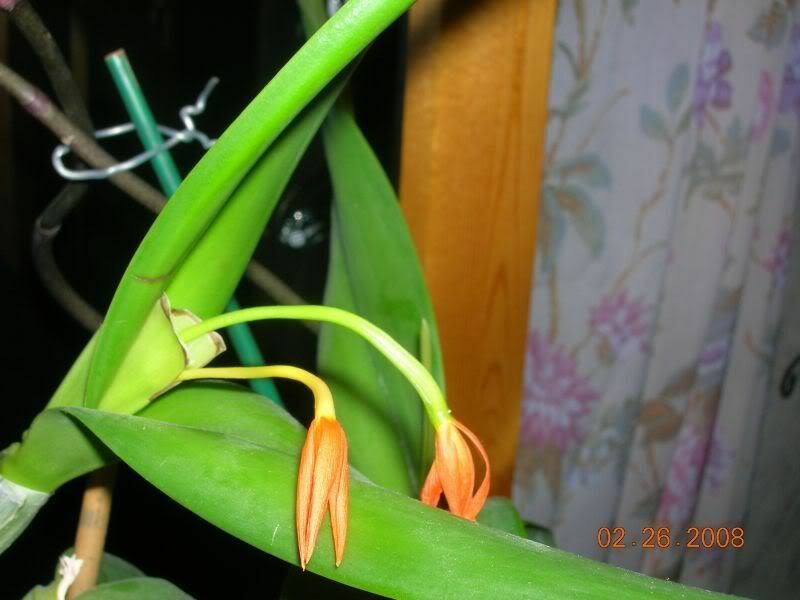 Ok last night was day 3 since the first of two blooms opened up. So I figured Id try to pollenate the first flower and keep the other for reference. I read somewhere here, that you would notice in 24 hrs if its going to do something so I wanted a control flower. I took the pollinia I had saved in a coffee filter out and grabbed a flat tooth pick. I first touched the flat end of the tooth pick on the stigmatic depression (its the area behind the anther cap). Since its sticky back there, it will help hold the pollinia on the toothpick when trying to do your thing. I then put the pollinia in place and gently pressed upwards to make sure I had contact. This was done on the right flower last night. Now tonight the 2nd flower was open enough so I wanted to do that one tonight. But first for reference. When I conpared the flower I worked on last night I noticed that the lip is curling to form a tube instead of being somewhat being a 1/2 pipe shape like normal. Also the two petals are crossing each other which isnt normal. Does this mean I've succeeded or just damage from handling during pollenation..?? time will tell. I hope it takes. heres the pics for reference. 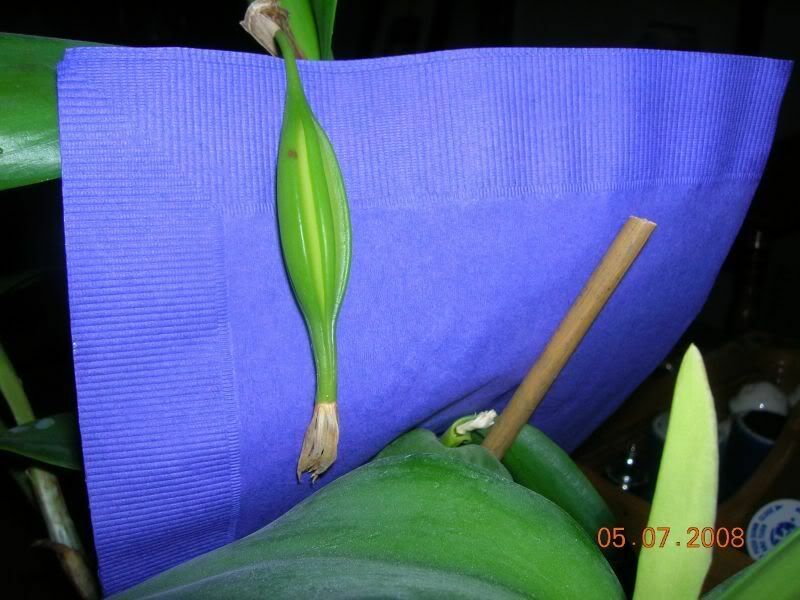 Please note, using a clean, sterilized exacto knife, I trimmed the sheath back after it was open so I wouldnt accidently snap off a flower while working on it. This is the control bloom. The left flower which I did tonight while taking these photos. this is the right bloom which I tried to pollenate 24 hours ago. Note how the lip is now forming a tube instead of being normal. Bolero, Brix and orchidfever like this. Now if you thought I was anxious while waiting for these buds to open.... Guess how I feel now to the 10th power. Wouldnt you know it, I picked a dandy to work with. 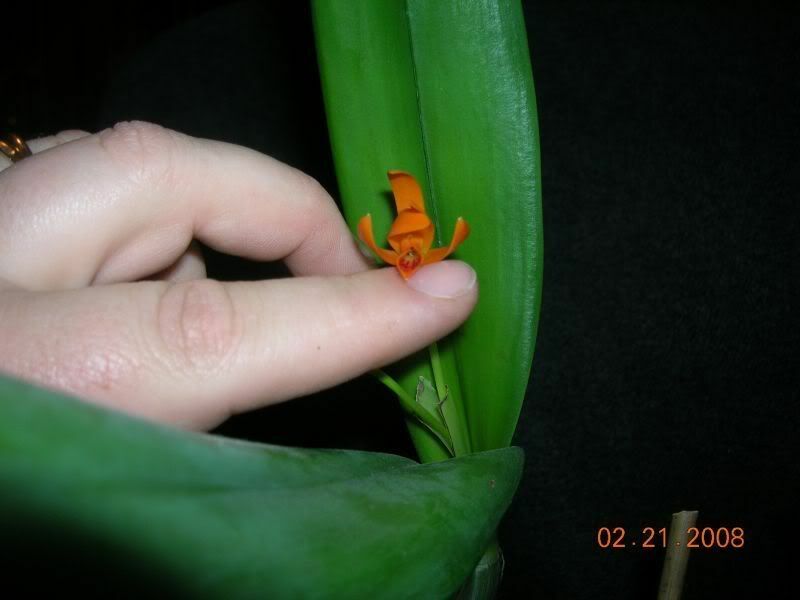 I was doing some reading on my orchid and supposedly, it has the smallest flower size in Cattleya. The article is a tad outdated since it's been moved to a different genus now. But still there wasnt alot of room to work in while trying to keep the pollinia on the toothpick and not on the floor. Good luck!! I have always been fascinated with hybridizing. Done some with other plants, but never with orchids(yet! )- I've been reading a lot about it. I have a couple of Catt. crosses, and a Paph. cross coming in the mail to me soon. It's like waiting to open a present! I can't wait until I can do the whole process! Keep us posted! I look forward to hearing about, and seeing the progress! I checked again when I got up this morning and the lip is locked up like fort knox. I think this flower has removed its welcome matt. 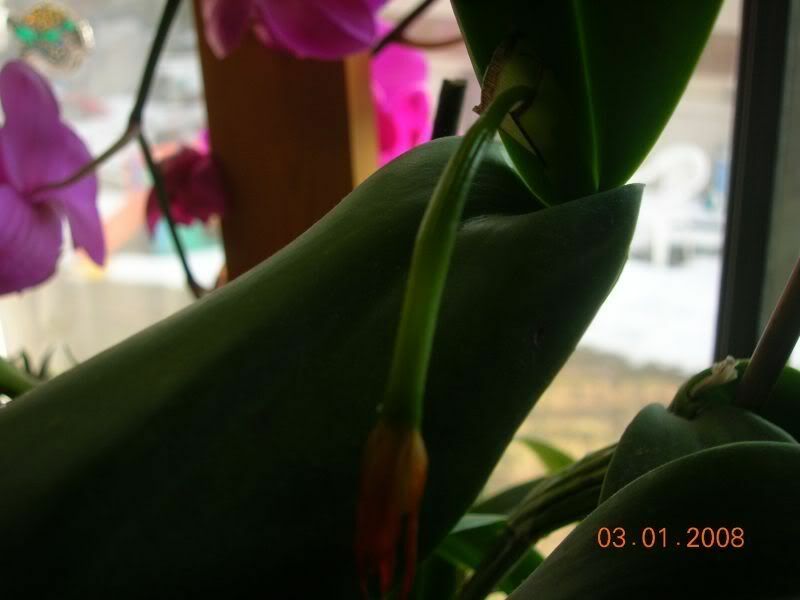 orchidfever and JackiePS like this. oh goodness this thread is going to be older than me... I already 400 years old..
five days since I started my cross and it looks like one of the two didnt take but theres good sign on the second that I might get a pod....God willing. The flower on the left is turning yellow and looking bad but the first one I did. 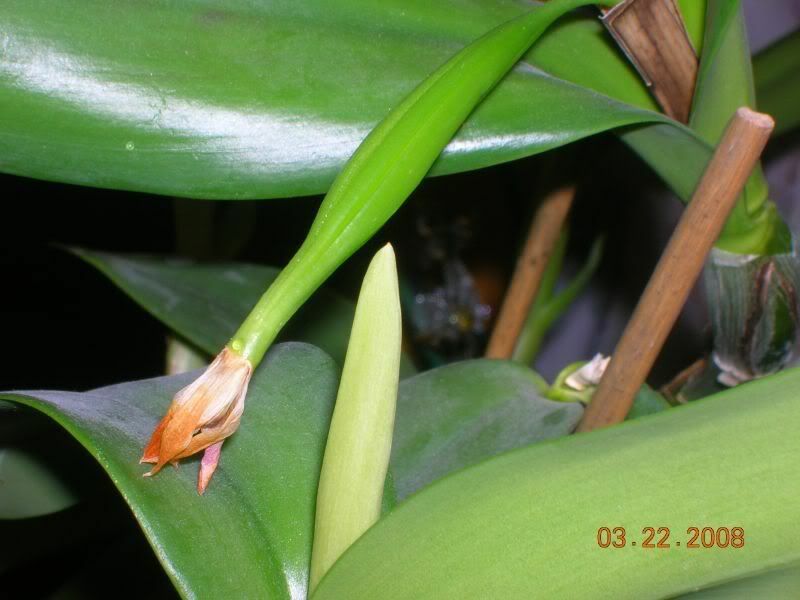 The flower on the right, the stem of the flower is getting uniform in thickness and staying green in color. 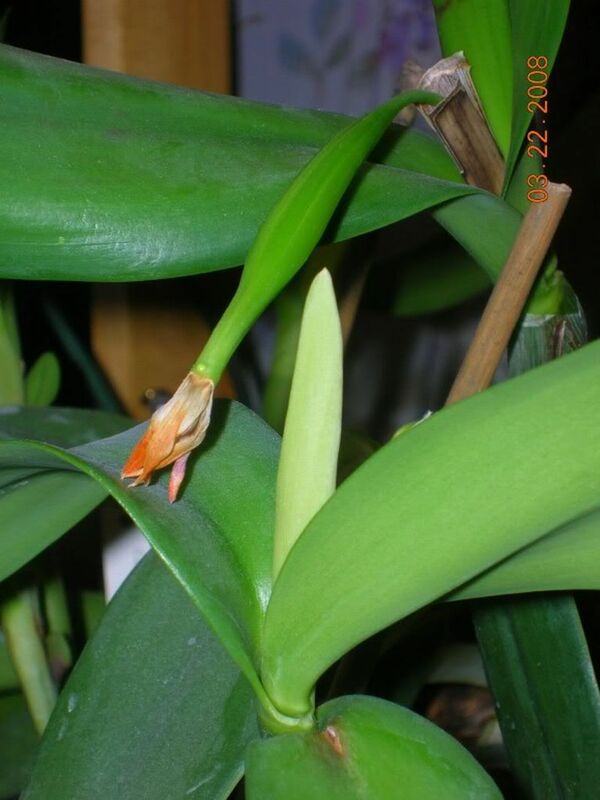 Someone mentioned on the aos that it might not be possible because my pollen parent is a 4n and the pod parent isnt. I dont know what that means. But I have hope. I'll be persistant and also pick up a few other Catts to try later. Last edited by exasperatus2002; 02-26-2008 at 12:31 AM. The one on the right looks promising! A 4n- is a tetraploid. When crossed with a diploid will create a triploid. I believe that the problem would be with crossing a diploid with a triploid, not the tetraploid. This is what I read. Not having hands on experience, who knows. Diploids have an even number of chromosomes. Tetraploids have twice that-(4n) Triploids are (3n). Whew! I'm all 'ploided out! Good luck! Continue to keep us posted! hybrid. only 10 to 20% successed. I've read that the chromosomes have to be even to take. In this way, even 5n and 6n are possible. I know that my tetriploid daylillies are much sturdier and robust than the diploids. I assume it's that way with orchids. Any imput from the pros? Brix and orchidfever like this. Looks like progress! So far so good! When can we expect the appearance of little ones??? for you and look for a cheap and good ones. Thanks digitalgate. I hope it can take a beating. 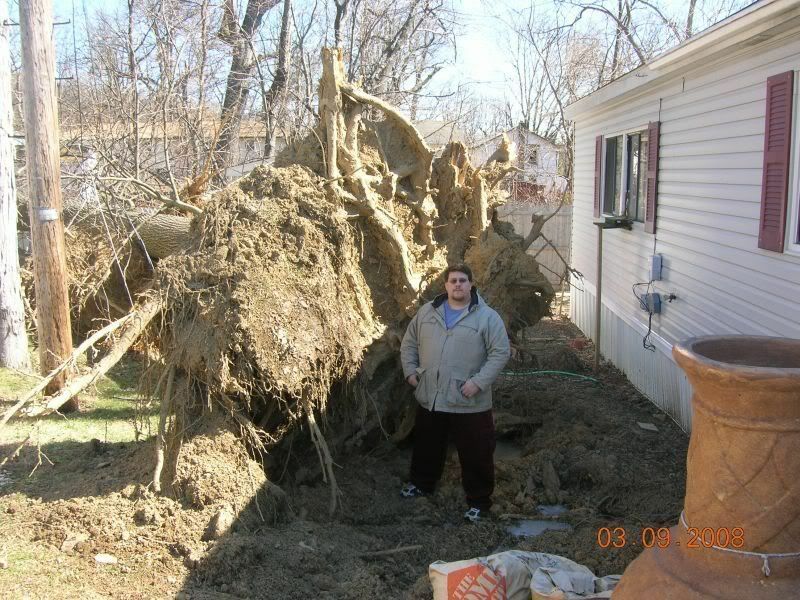 We had a storm on saturday and we have no utilities and wont for another day. Its in a south window and warms up during the day but the nights are getting chilly. You know what they say, anything worth a lick didnt come easy. Yeahh!!! I've got my utilities back!!! 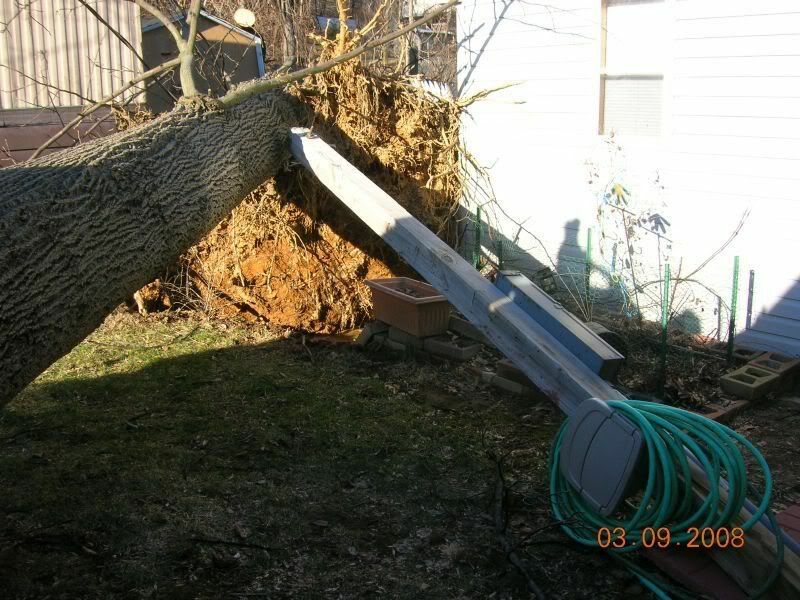 Saturday we have 50-60 mph winds during a bad storm and 2 trees came down and destroyed my utility service. No power, heat....nada. My family and I stayed in a hotel sat & sun. Then, after the landlord claimed act of God & stated he's not willing/responsible for expenses incurred due to his tree cutting off our service & waiting for him to get a certified electrician to replace the meter breaker & ug. power line, he was gracious enough to allow us to tap the electric from our recently evicted neighbors trailor to run the chest freezer and wood pellet stove so we can come home. 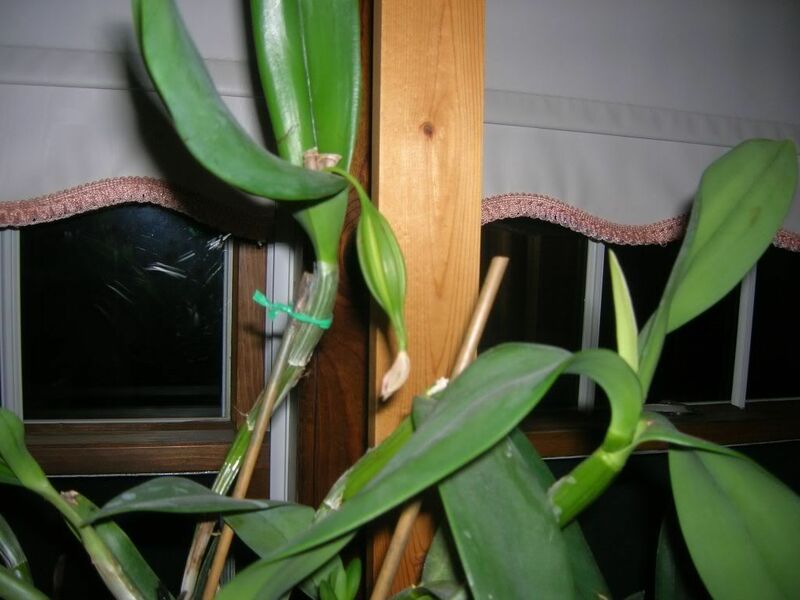 My orchids seem very resilient. Over the weekend there was no heat and I needed atleast a fleece jacket to stay warm. then with the pellet stove on, it was mighty hot in here. 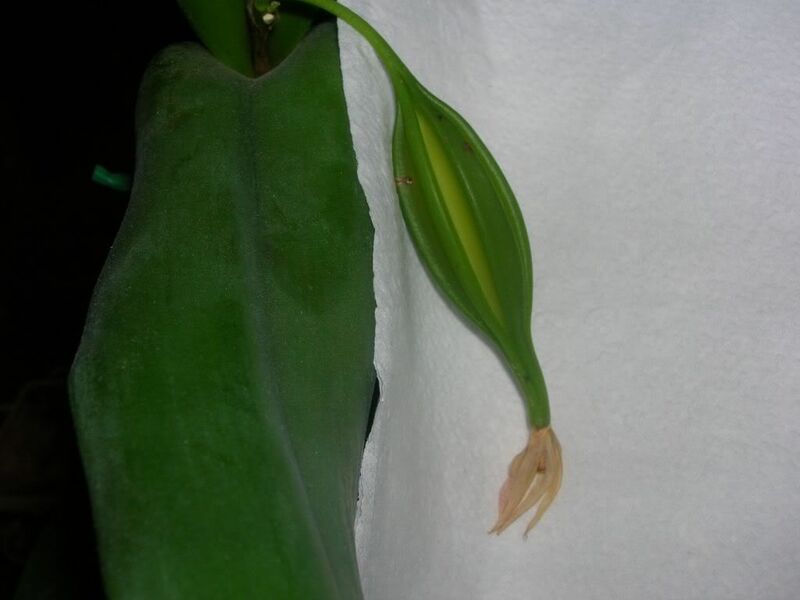 My Phal didnt blast any flowers and my 1st attempt at a hybrid is still alive. 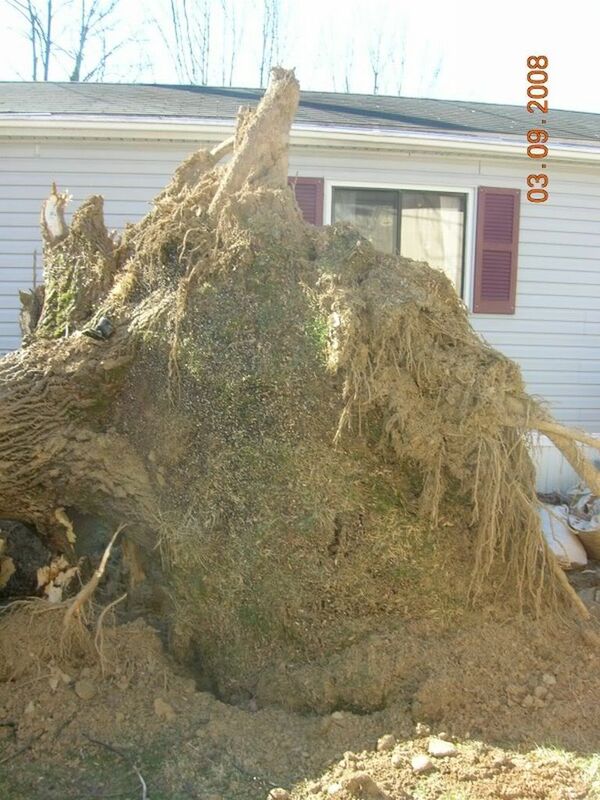 Heres pics of the storm damage & of the pod. With my mortgage & lot rent, its cheaper then a 2 bdrm apt. and I get a yard to work. I just put a deposit on a house which is sweet. OMG. You are so, so lucky that was the only thing damaged. 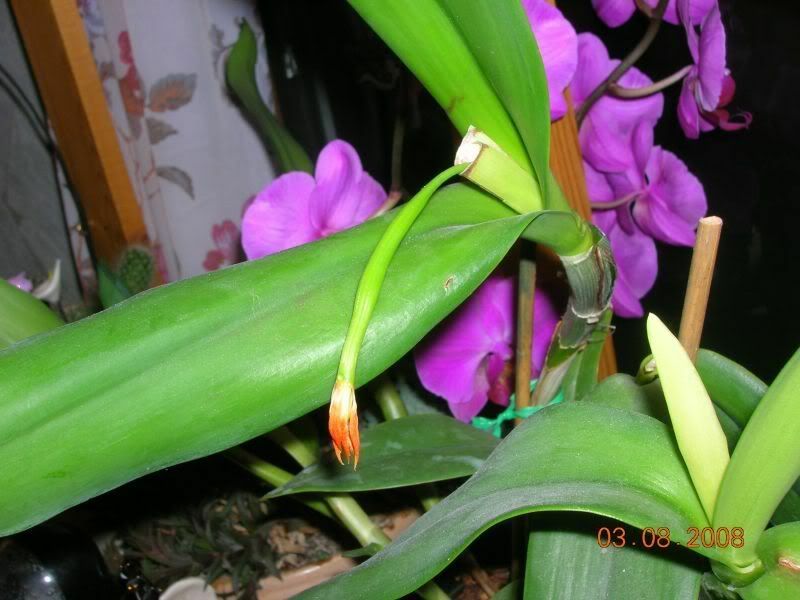 So glad that you and your family are okay and that your orchids are doing fine as well. Unbelieveable how some landlords can be. Last I knew there's this thing called insurance that's suppose to take care of stuff like that. Unreal. OMG! I'm so glad that you're O.K.- Your plant too!!! 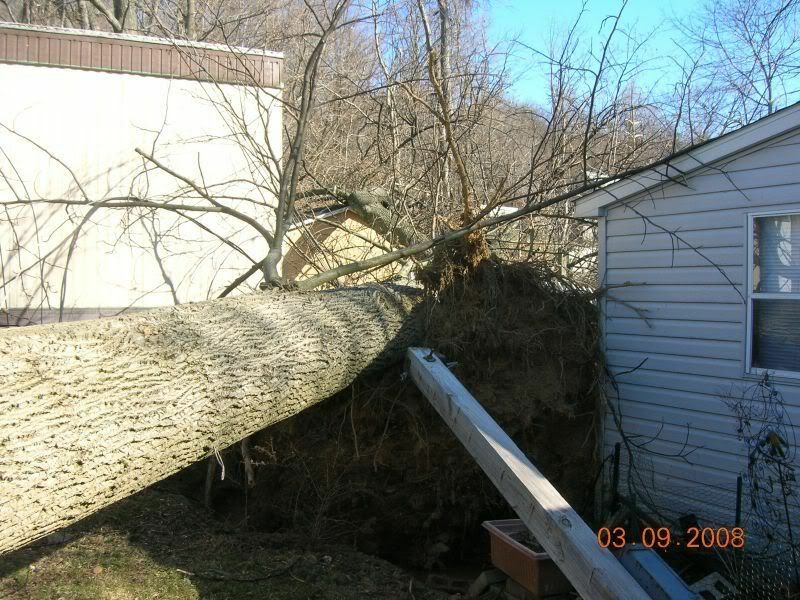 WOW - aside from the utility and landlord situation - that looks like a mighty lucky fall!! Talk about an inch in either direction. Glad you, the family and the chids are okay! I'm new, but SO glad you're ok. My sister in law lives in Altoona, so I watch Pa's weather a lot! Good luck with the babies! I'll be watching for them! day 31---9 days since the last pic. theres been an increase in swelling for only 9 days. I fed it, maybe thats why. 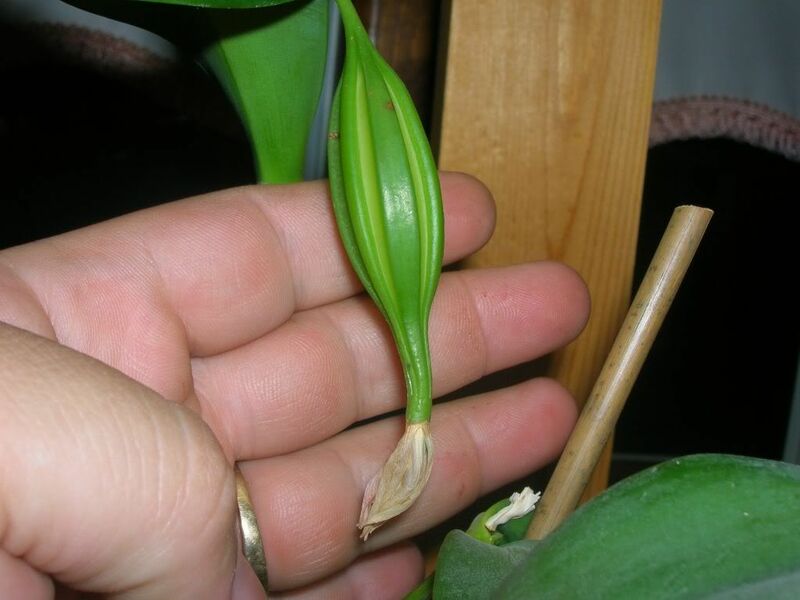 The other day I was thinking why, if orchids have no nutrient stores in their seeds, why does it take so long for a pod to mature. But I think I answered my own question. 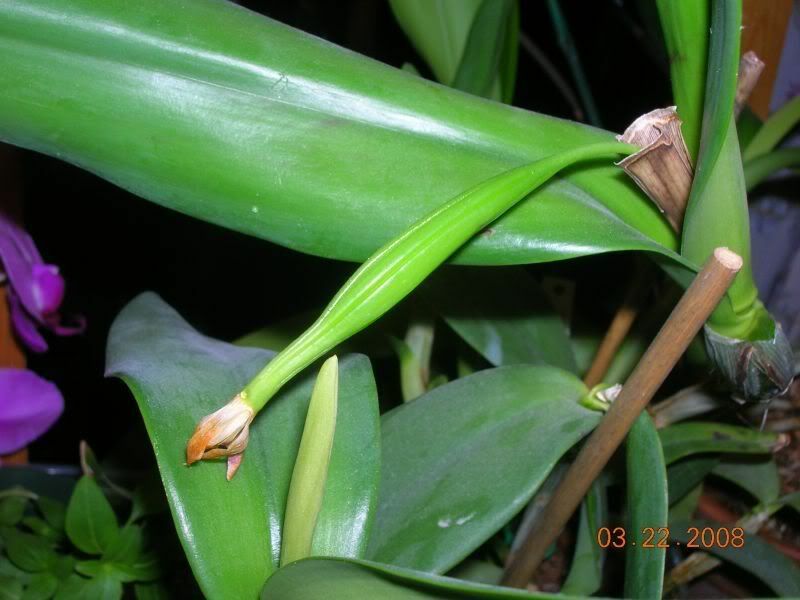 Since orchids rely on fungi for a source of food in the wild(remember thats why we have to flask them since they need a particular type of fungi for their species). Where as regular plants have complex roots and derive what they need from the soil. 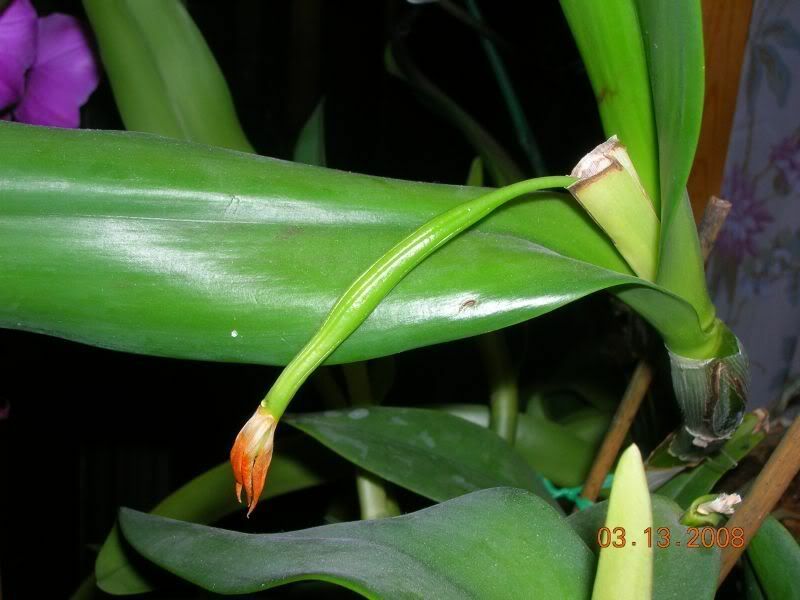 Our epiphytes dont have that advantage. I love it. After all that you've been through- these guys are still doing well. Keep up the good work. I love this thread. Thank you for sharing your process. I can't believe you got it done! Congrats! long five month wait. and 4 years before we see any flowers if we are lucky. Please, remember to keep us up to date. Does anyone have a clue as to what Genus it'll be assigned to? 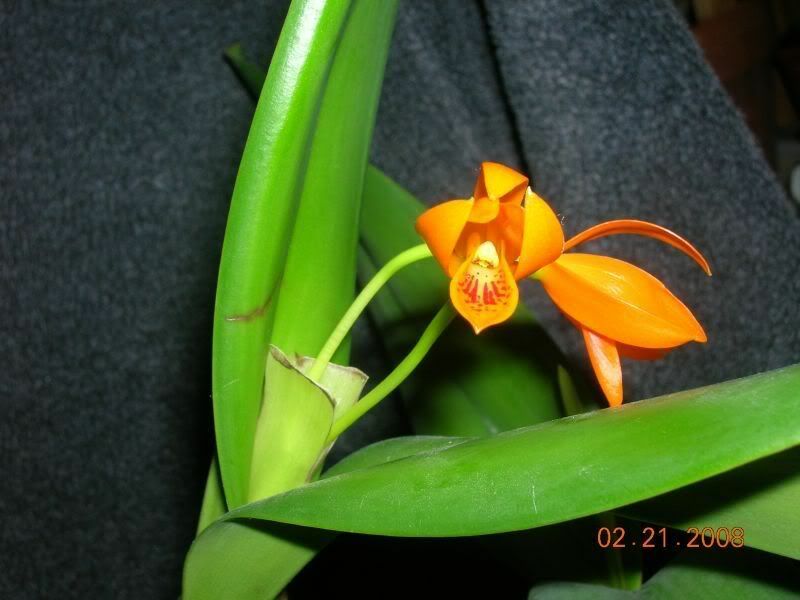 Its a Blc. x Guarianthe hybrid? Update- Day 55-- still growing ok. Awesome "footage"! It was really amazing to see the whole process. Thanks for sharing!! Looks nice. it's going well. It looks REALLY good! I don't know what genus- I'm still working on figuring out a lot of that! I love the shape the pod is taking on! would love to know more! What is to be done with the pod? When will it explode? Make sure to put a baggie over it! nah,,,, a good 3 month before anything happen. excellent thanks for showing us how its proceeding keep feeding our curiosity! Day seventy six and still good. Being patient waiting for it to mature is harder then when I had to wait for my wife to pop. Speaking of which, my daughter turned 1 today. This is a wonderful thread. How exciting. I can't believe you can wait and be so patient. Please keep us posted with more pics. I want to see more! Happy 1rst B-day to your daughter. Gosh they are so adorable at that age. I'm hoping for a little girl too. I'm not expecting yet but planning to be next year! Last edited by solay; 05-08-2008 at 02:13 AM. The pod's looking good! At least you won't have to wait as long as I did for my zygo-cactus. Those pods take 2 years to mature!! Your pod is a couple of months ahead of my cross. It will be interesting to share results! Thanks for doing this thread. It's really interesting, and I've learned a lot from it! 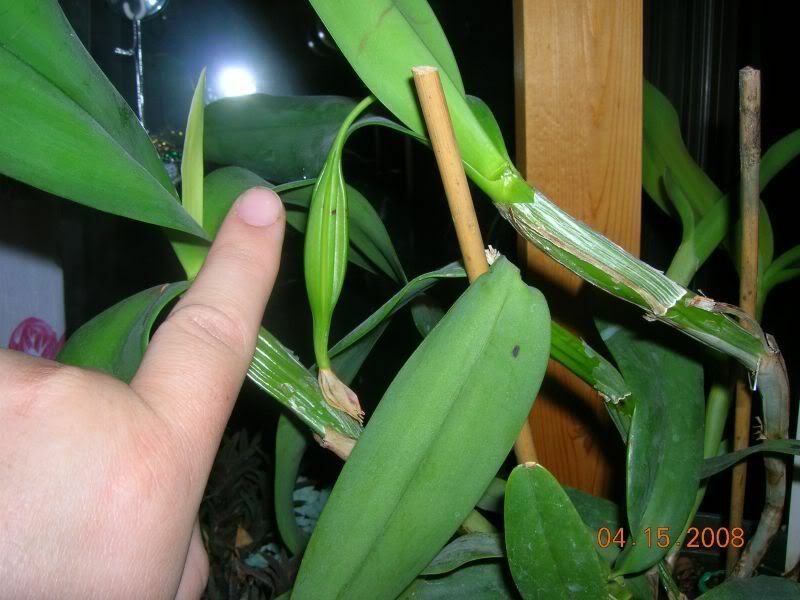 From what I've, Cattleya pods can take 4-6 months before they're mature. If I had myway, I'd be deflasking right now, but biology dictates I have to wait, not only for the pod to ripen, but also for the flasks to come back once I send the pod out. BTW: Happy B'day to your daughter. Thanks. The pod will show signs that its getting ready to open (dehisces). The veins will start to yellow first. 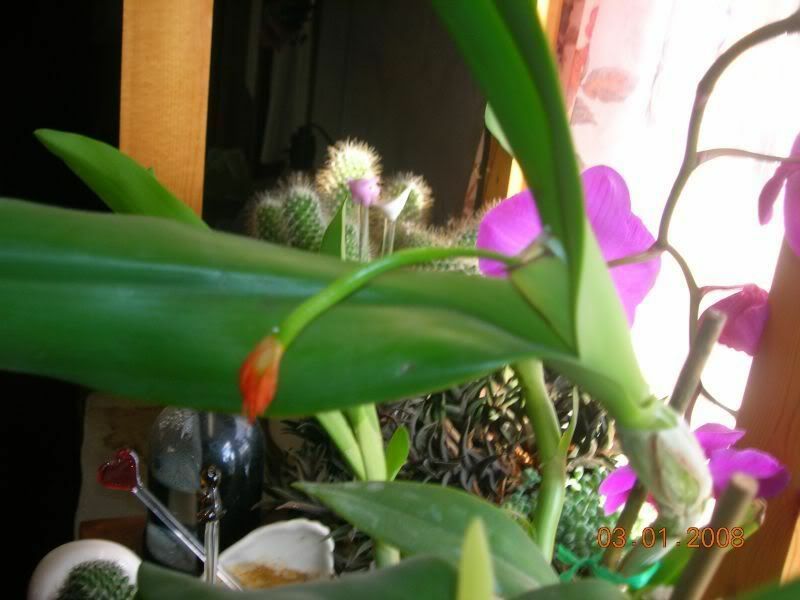 Then a small split will usually start where the flower was. When you see the split, you shouldnt hesitate. Remove the pod. 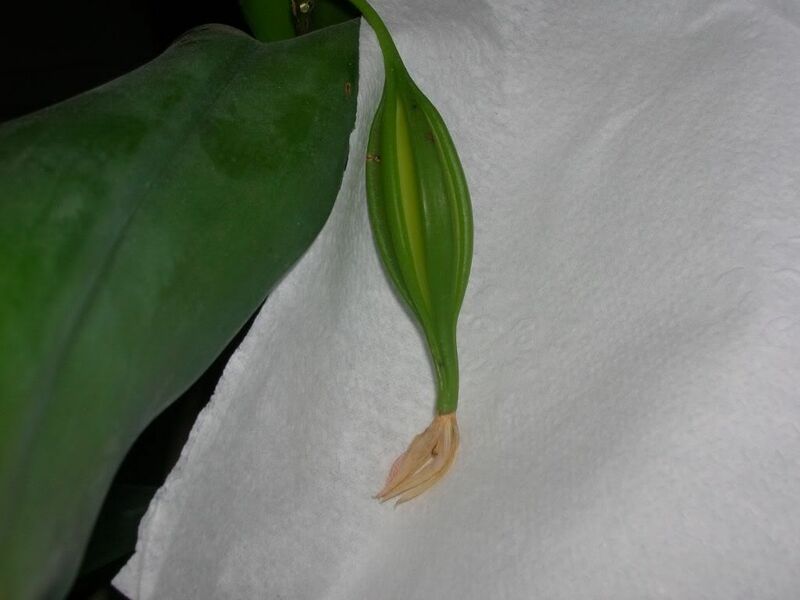 Use a coffee filter and enclose the pod so when it does split you dont loose the seed. 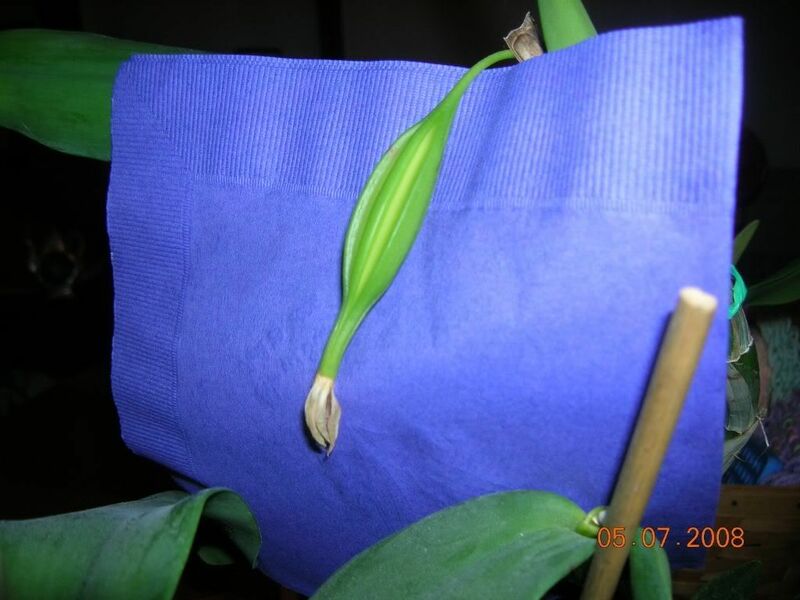 Orchid seed is very fine. Once harvested, send it to your flasking company. Dont forget to let them know its on the way so they can have everything ready. they prefer receiving the pods before they open to keep the seed sterile. If it splits open before they get it, it just adds some extra work to their job (they have to sterilize the seed before flasking). At the same time you dont want to remove it to early or else you'll get a lower seed viability count. It seems that the seed form but the embryo inside the seed is the last to mature. You can end up with alot of duds in the pod if your to hasty. If I've missed anything so far, please let me know, this is a learning lesson for us all. Then what? How long does it take after that? I know it's a long process but is it years or months before you get some seedlings? I don't think I can be this patient. This is very exciting. I thought about crossing roses but then it seemed so technical. Thanks for this thread. I'm enjoying it. From the time its first flasked until it needs to be replated (fancy way of saying all the little chids ran out of room in 1st jar & need to be divided up & reflasked), it can be from 6-12 months depending on the species. Then after replating its another 8-18 months, again dependant on the species until they're large enough to be sent home for deflasking. The pod will be 4 months old on 6/18. This is like waiting for Christmas, I cant wait to move to the next step (harvest & shipping of the pod to a lab.) 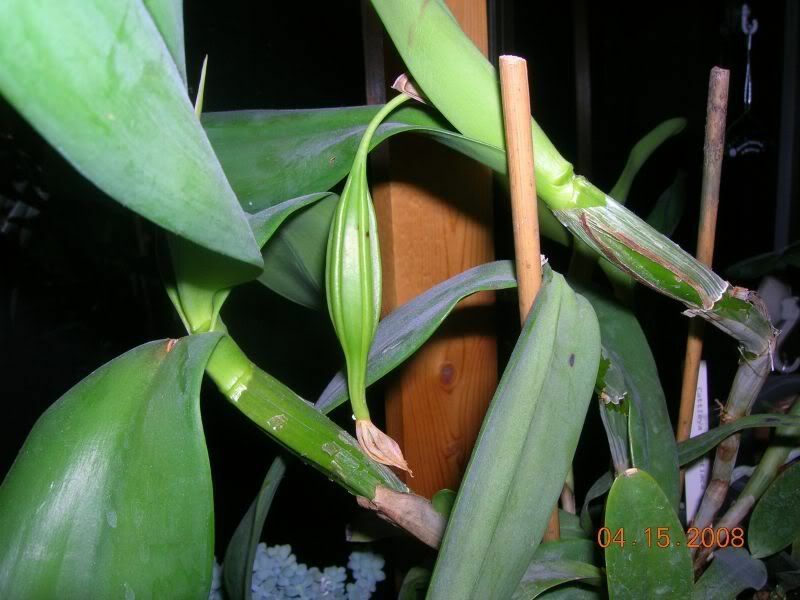 While I've been waiting, she has put out 2 new growths. The title says it all : Step by Step, lol. I would have been ancy from day one. Do you any pictures for this week? My cross is from 4/18- exactly 2 months behind yours! I'm nervous about harvesting at the right time. I'm hoping that yours will give me an idea of when mine will be ready. I'm really excited for you! When and how do you register the grex name? You're the best...thanks for this thread! You have to go the royal horticultural society website and download a pdf for the applications. 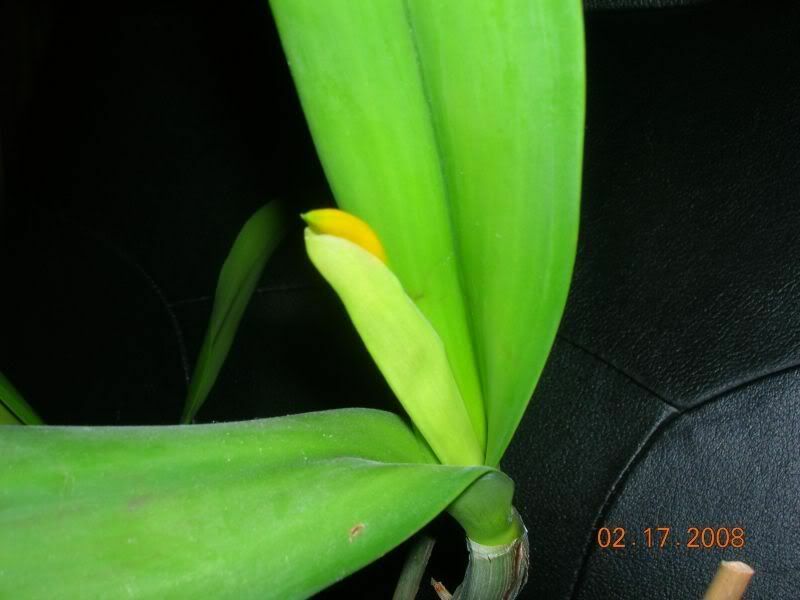 It asks everything about the orchids, who was pod/pollen when was the cross made, when was its first flowering...ect... they also ask for a pic of the bloom. then you mail it & a payment to them to authenticate. If accepted, it will also appear in RHS publications. That is very interesting stuff. I think it's very exciting. Thanks. I will wait for more posts. The two brown spots are minor physical damage from when the washer machine repair guy bumped the stand with his tool box at my old place and it got knocked over. Its had them for months with no expansion. 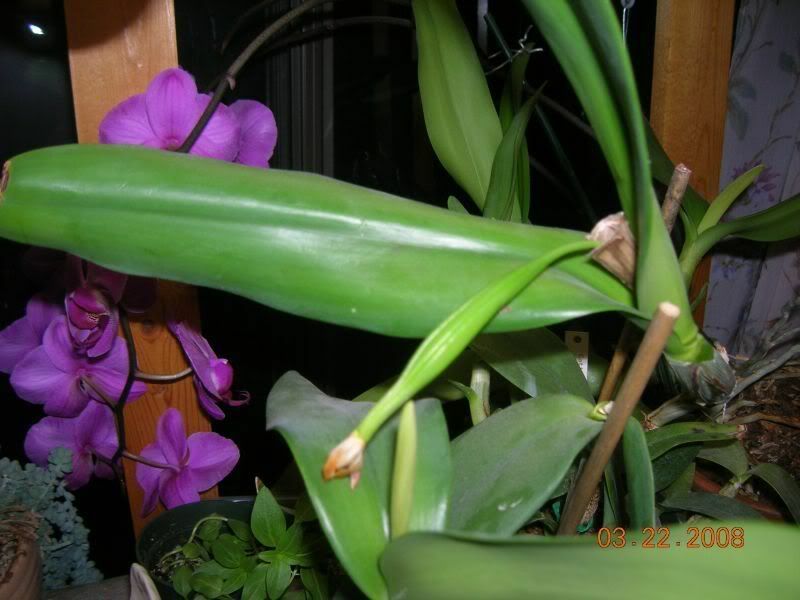 Phalaenopsis hybrids for green pod germination have wait time of 110 days. 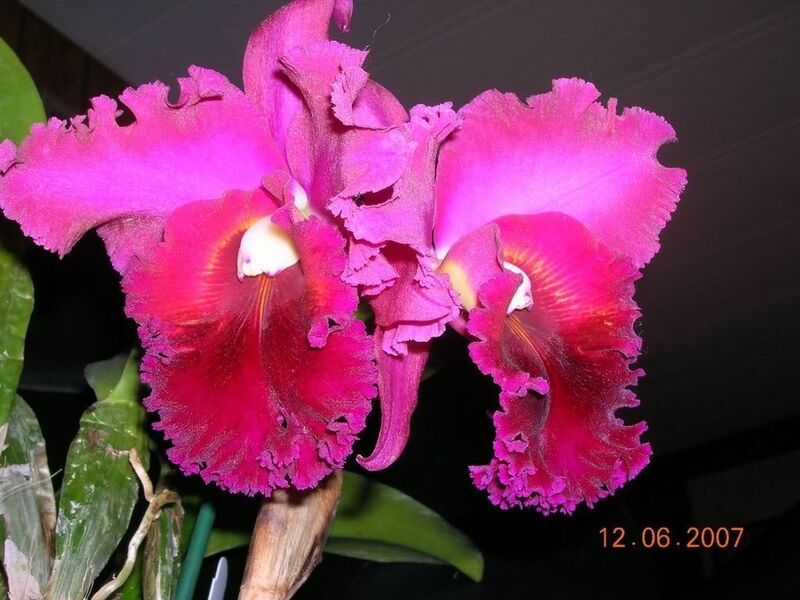 Cattleya hybrids are between 4-6 months. Last edited by exasperatus2002; 06-06-2008 at 09:02 AM. 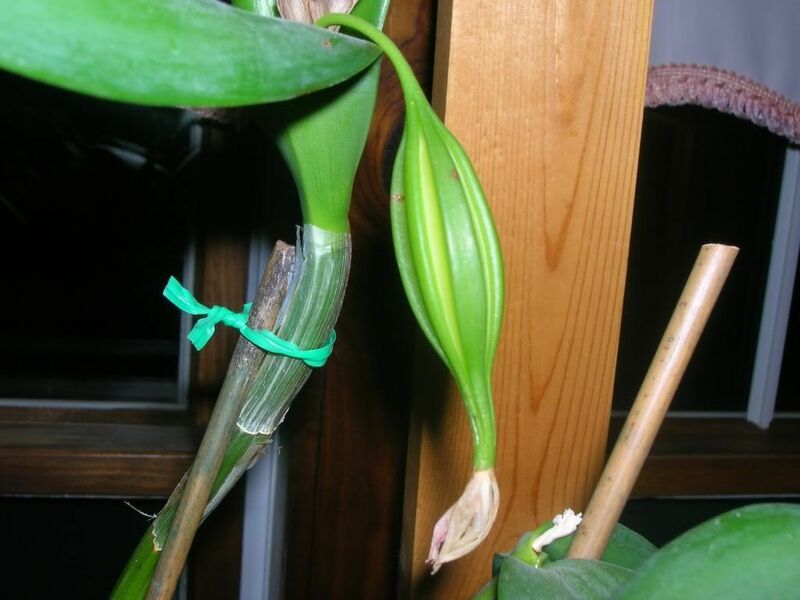 I've only just realised recently that vanilla pods are actually orchid pods! Well. that's MAMA. I was wondering if it would be a good time to post a picture of PAPA? I've forgotten what the other plant looks like. This is so exciting. You have incredible patience. I know it will result in a beautiful flower in 8-10 years. 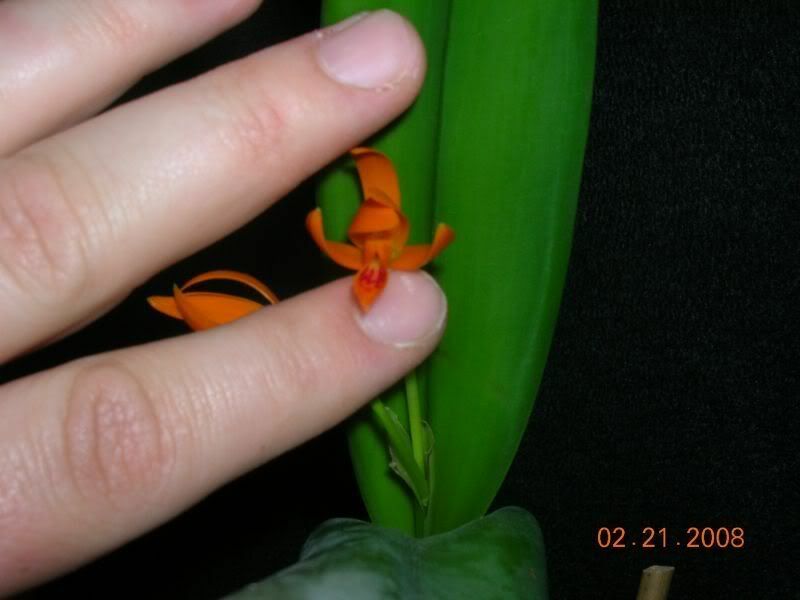 I'm always amazed by what little Cattleya orchids cost when all the time and care is considered. Good Going! My wife bought me papa (Blc. Chia Lin 'New City' AM/AOS) as an early chirstmas present in spike and 1 week after it was in full bloom my cat broke the spike off. 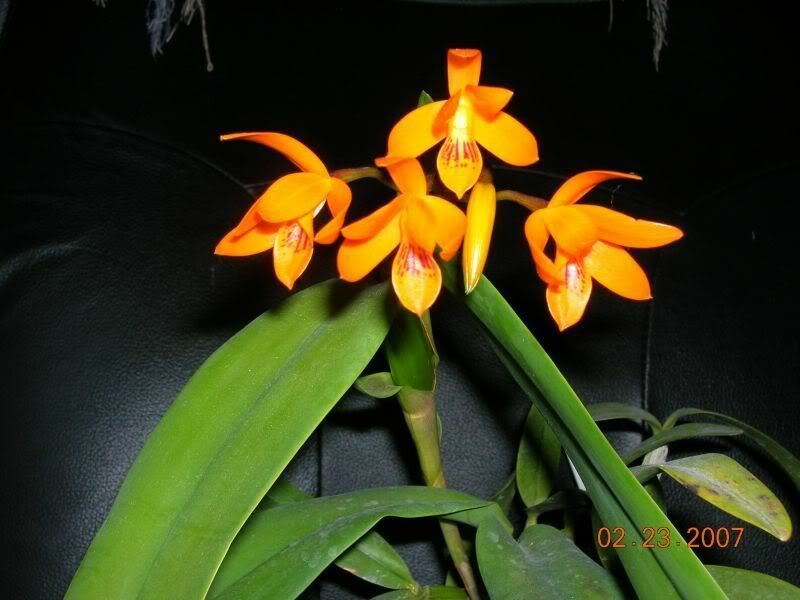 So I harvested the pollinia and saved it until my Guaranthe (formally Cattleya) aurantiaca bloomed. Absolutely gorgeous! I bought a seedling at Lowes with the name of BLC. LIN 'SHIN SHU' AM/AOS. I've tried to research what it will look like and everytime I type it in I get referred to websites naming BLC.Chia LIN 'SHIN SHU'. I was wondering if my plant might be a relative of yours. It's supposed to produce a purple flower. I hope your babies get that big, beautiful lip from Papa. Thanks for sharing it. That looks like the kind of cross I might try, just to see what happens. Something in the middle of those two could be really interesting. Good luck. Thank you so much exasperatus. Now all I've got to do is to wait the six years until it blooms. I definately think our plants are brothers! I didn't know Lowes has a website. I'm going to try to see what my other bought hybrids look like, if that's possible. I am sooo excited for you! I can't wait to see the results of such an interesting cross! This site has inspired me!! Nancy... whats nice is you can order direct from their website. 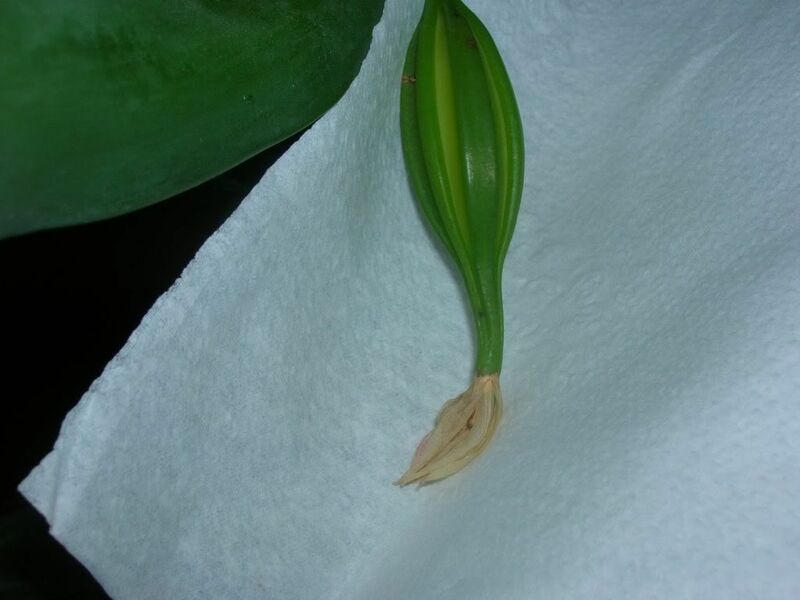 They even have Neo's, Stanhopea & vanda..sure they'll be small but isnt it good to see things grow up once in a while? Patticake...Your welcome. How is your pod coming along? Any pics? To think I started this project in part because my wife & I were at a show and she asked if there were any orchids named Cassandra. 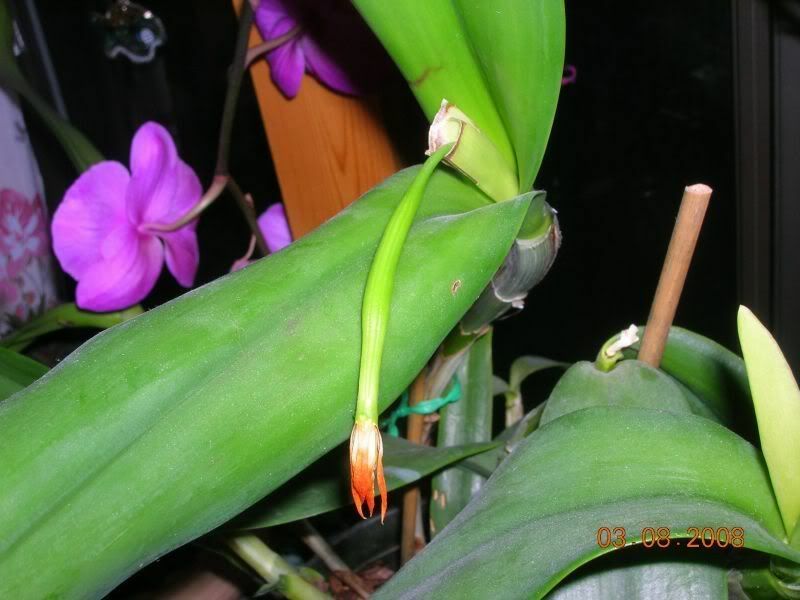 Which there is a white Phal. When we saw this ugly little white Phal. I said that it doesnt deserve to be named the same as my beautiful daughter, so I started my hybrid. I was eventually going to do one anyway but if its named after my daughter..the better. It'll be something she can be proud of. updated pics on day 128. I anxiously await sign that its time to send her to the Rockbridge labs for flasking. Im checking on the pod daily now that we're past the 4 month mark. Catt pods mature in 4-6 months. Greenhouse growers have a shorter maturation time then home growers like myself. I got good close ups this time so the brown spots (physical damage) show up better. 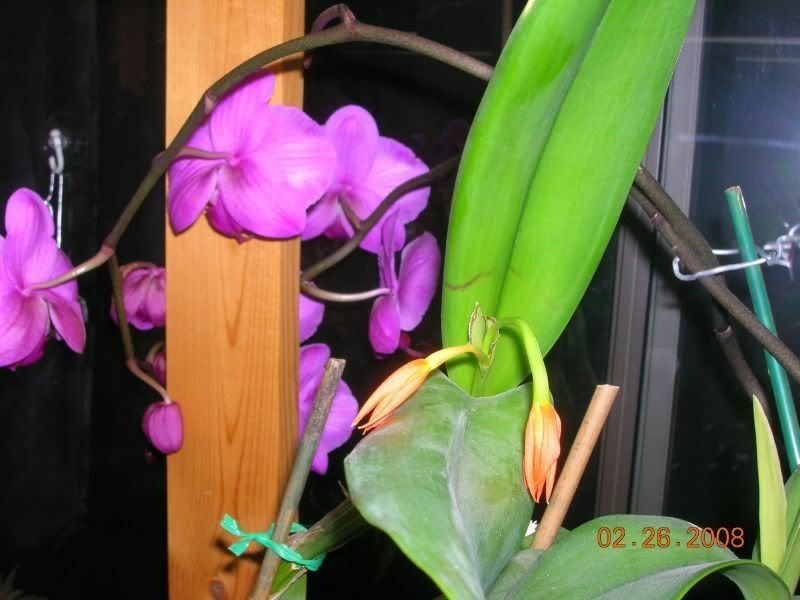 They were caused in jan/feb when the orchid stand got bumped into at my old house by a washer machine repairman. She's in a plastic pot and need to repot her since most of her growth is off center and to the edge so she's unbalanced and tips easy. She fell over onto my wifes cactus which now have their own window sill. It looks good, scott! I read somewhere that the veining starts to turn yellow as a first sign of ripening. Is that what yours is doing? I'm like a new "Aunt" or something, here! Keep up the good work! I'll take a pic of my pods soon. I have to bring my daughter to a summer camp tomorrow where she'll live for the next 2 months as a counselor. It seems like yesterday that she (and her twin) were your daughters' age. It goes fast. When we get back, maybe I'll do a pod shot as therapy. My other daughter is in Florida. I'll be picking her up in August! Yay! Edited I draw the line I have said many of times not to enter into general chitchat in the orchid sections. if you wish to take this thread OFF TOPIC post in the General Chat section. 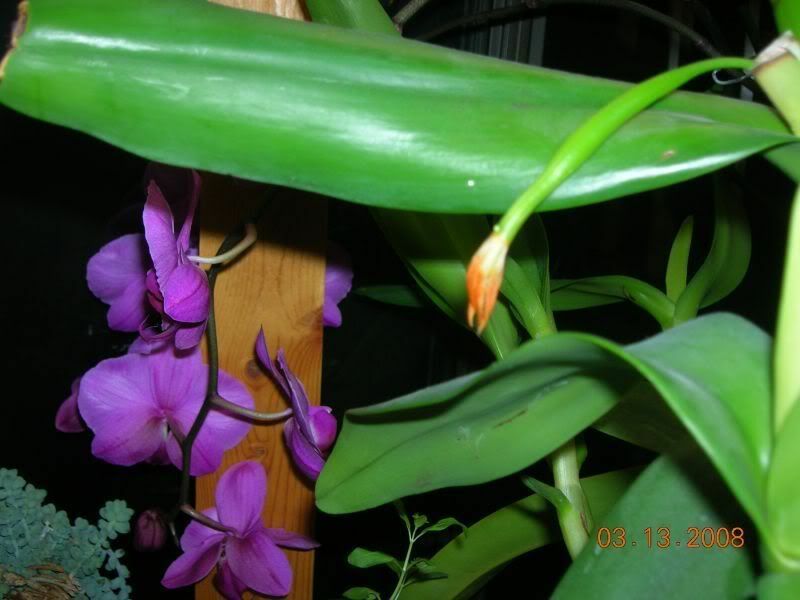 this section is for Orchid Care Cultivation nothing else. Very interesting. The pod looks really good. When will it be ready? Can't wait for the seedlings. Keep us posted. Location: South FL - Palm Beach Co.
Hello all....I'm a newbie to this board (although apparently I've been registered for some time now). I've carefully read through this thread......and I'm sure I speak for everyone when I ask: WHAT happened? I currently have 3 pods in waiting and this is my first time....so I'm hungry for ANY info I can get!! How is the pod coming along? Welcome to the board! The pod is going strong. Still no signs of being ready to harvest yet. I'm checking it everyday. its still green, no coloring yet or any cracks or other changes. Today is day 136 for this pod so it can start anytime now. 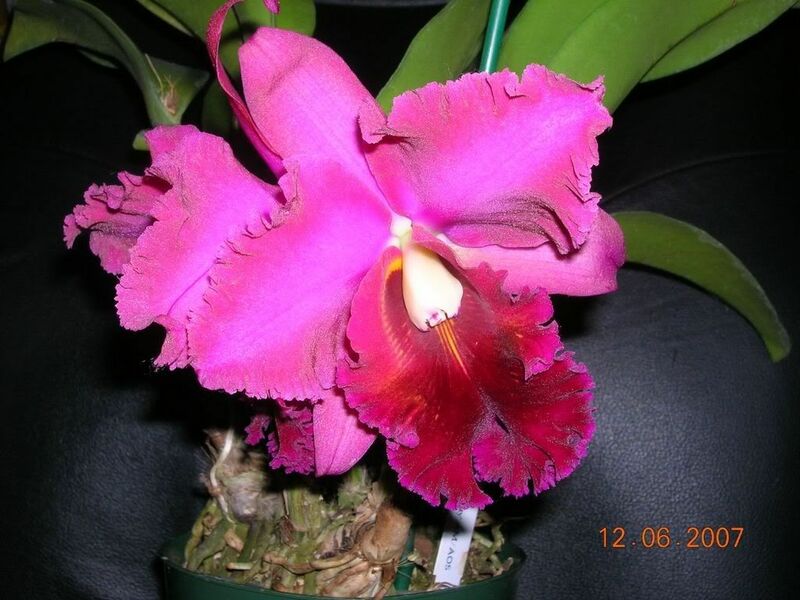 Generally Cattleya's are ready within 120-180 days (4-6 mnths).